This evening I made flounder for dinner. 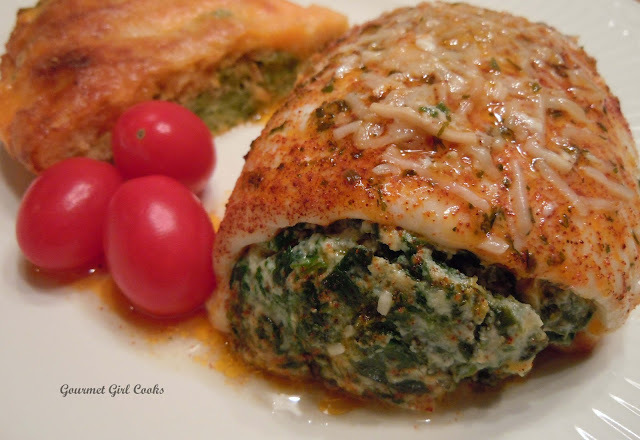 I made a spinach and cheese filling and rolled it up into the flounder fillets. 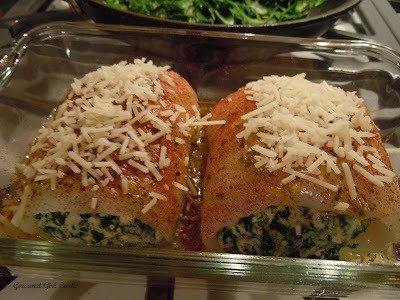 To make the spinach cheese filling, I quickly wilted and sauteed a few big handfuls of fresh baby spinach in olive oil, then drained and chopped it (about 1 cup of chopped spinach). I stirred in about 1/4 cup of ricotta, 1/4 cup finely grated Parmesan cheese, salt, pepper, dash of cayenne, and a couple shakes of onion and garlic powder. After it was all mixed together well, I divided it up and placed a mound in the center of each flounder fillet, rolled them up and placed them seam side down in a lightly greased baking dish. Then, I melted 2 tablespoons Kerrygold Garlic and Herb butter and zested and juiced 1/2 of a lemon and mixed it with the butter and spooned it over the flounder rolls and sprinkled with paprika and a little shredded Parmigiano Reggiano. I baked it at 400 degrees F for 15 minutes and then switched over to broil and broiled for about 3 minutes. I had originally planned to make a cauliflower dish to go with it, but decided instead to serve it with a wedge of my "Awesome Golden Cheddar Broccoli Pie" that was leftover from Thursday night. Since I cook almost every night, I need to keep up with eating the leftovers so I don't end up having to throw out good food at the end of the week. During the week, I eat my dinner leftovers for lunch, but since I rarely eat lunch on the weekends, I try to incorporate them into our meals, when possible. I snapped a couple photos below for you to see. Enjoy! I got this recipe from WB facebook page and I made it last night, and it was DELICIOUS!! Thank you for posting this, I can't wait to make it again, very tasty!! 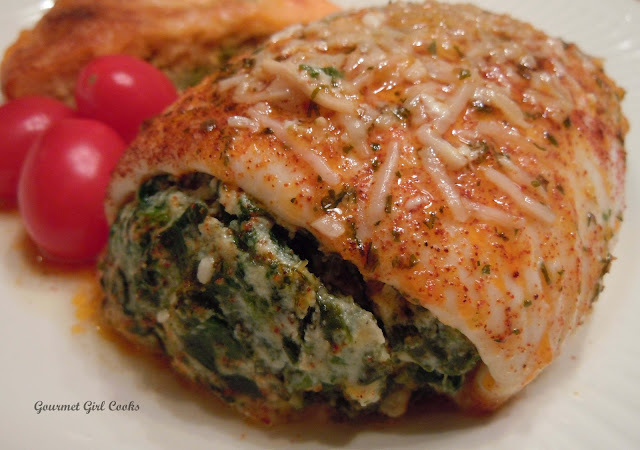 How many fillets did you use for this recipe? How many ounces (size) were the fillets? I know this recipe has been around a while, but just made it tonight...it was Great!!! Will definitely make again. Thanks!